Called “the language of enlightenment,” Sanskrit is truly unique among all the languages of the world. This ancient language, upon which so many of our English words are based, gives us an entire system to show what to do in order to experience the full meaning of a word. In this profound way, Sanskrit offers a touchstone of timeless wisdom that each of us can access to transform our lives and build confidence, certainty, clarity, and success. In Conscious Confidence, Sanskrit scholar Sarah Mane offers a practical confidence-boosting program, derived from the deepest meanings of Sanskrit concepts, to help you establish a safe and secure reference point from which to see the world and make clear decisions on how to act, what to say, and how to feel. She explores the Sanskrit roots of English words related to confidence and success, unlocking rich, three-dimensional understandings of each word as well as guidance on how to obtain confidence and find your path in life. For example, the word attitude, based on its Sanskrit roots, means “our point of view, our intent, and our conduct.” A positive attitude means we have a self-aware point of view, have an intent for the good, and conduct ourselves in ways that reflect both. This true attitude gives us a positive and powerful place from which to view the world. The author also incorporates traditional stories from East and West, such as the Mahabharata and the works of Plato, scholarly references, and accounts of people discovering hidden depths in their own lives through the ancient truth of Sanskrit. Drawing upon the deeper meanings behind several Sanskrit words for confidence, Mane outlines principles for harnessing the fourfold energies of Conscious Confidence and offers practical exercises for discovering our inner certainty. She explains how the Conscious Confidence method allows us to tackle the growing anxiety and fear that hang like a shadow over many of us and look to the unchanging core of selfhood for certainty, rather than ever-changing externals. With the Conscious Confidence program and the wisdom of Sanskrit, you can discover a strong and steady inner source of compassion, self-direction, self-empowerment, and the life force of self-confidence. The ancient language of Sanskrit, used by the sages of India to write their poetry, epics, and works of profound wisdom, is an incomparable tool for delving into the truest knowledge. Sanskrit is not just a language to be written and spoken but is also a doorway to gaining understanding of our experience of life and truth. 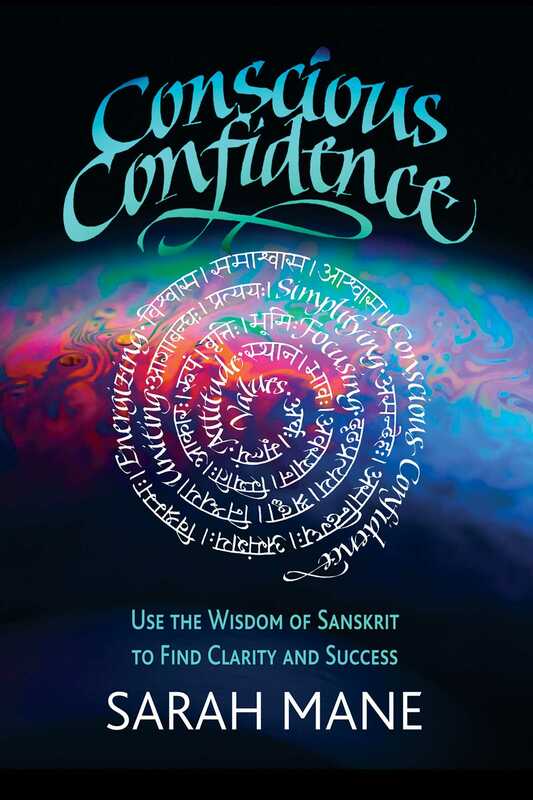 The aim of this book is to welcome you to the world of Conscious Confidence, a practical way to use the wisdom of Sanskrit to find clarity and success. By reading this book, you are connecting to a thread of timeless wisdom that has guided humanity throughout the millennia. Opinions, viewpoints, and attitudes come and go, but this golden cord of conscious wisdom is ever-fresh, relevant and powerful. It is wisdom upon which we can utterly depend. Conscious Confidence is like a great tree with deep strong roots, able to withstand storms and tempests and also provide shelter, stability and nourishment. It is grounded yet continually growing, expanding, and evolving. Sanskrit and timeless wisdom help us to plant that tree and deepen those roots. Conscious Confidence is the confidence you have when you live boldly and courageously from a commitment to giving the best of your own unique self-expression. It is the confidence you experience when you are awake and aware of your own potential and strength. Our life is an expression of what we hold in our heart--of our understanding of things and their meaning. This book is designed for you to consciously redefine those meanings and discover new dimensions of understanding and awareness from the depths of Sanskrit wisdom. This will awaken you to your potential, your core values, and what’s really important in life. With the ancient wisdom of Sanskrit, you can learn how to transform pain and suffering to joy, freedom, and fulfilment. What does Sanskrit teach us about balance? The Sanskrit word for balance is santulana, meaning to weigh one thing against another or to balance together. This seems rather circular and obvious, so how does this help our understanding? The key point of this word “balance” is measuring. Measuring means knowing when to stop one activity before embarking on the next. An analogy may help, so imagine a set of scales. If we intend to measure out a quantity of sand, and we want to keep the scales balanced, then we need to measure out the same quantity on each side. First, we pour an amount of sand into one side. The scales will be unbalanced at this point because there’s nothing on the other side to counter-balance yet. Then we start carefully pouring sand into the other side. Slowly both sides of the scales move closer to being level and balanced. Now we reach the crucial moment, where we determine that both sides of the scales are balanced, and we stop pouring. If we continue to pour more sand, we will create another imbalance on the other side. Achieving balance hinges on stopping at the right moment. Thus, the essence of balance and measure is knowing when to stop. This can be obvious such as when we work too long and too hard and it is time to go home. On another level, it can be time to stop thinking and to take action, or it can be time to get our feelings under control and begin to reflect on the lesson we can learn from a challenging experience. Too much thought and not enough emotion causes an imbalance and we can be cold and disconnected. If we are overly emotional, we can be irrational and unsteady. When we are not aligned, our actions and choices do not balance our head and our heart, and the body usually bears the brunt through stress, tension, and a lack of wellbeing. In this starter practice, we’re going to use a volunteer organization to trigger our self-reflection on our own Core Values. Think of one volunteer organization that you’ve heard about and appeals to you. Consider the values of that organization. Orange Sky for example is based on respect and dignity. Other organizations may value service, care, or compassion. If the organization that you select doesn’t have any stated values, then reflect on what you feel to be the values that underpin their mission, and what they do. Write down three to five values of this organization. For example, in the case of Orange Sky the list might expand to include: respect, dignity, compassion, care, and service. Research the meanings of each of the listed values of your selected organization, so you broaden and deepen your understanding of those values. There is always more to learn. This exercise helps us to transcend any assumptions. You might look up each word on quotation websites to find out how, for example, Shakespeare, Oprah Winfrey, or Martin Luther King used the word. Make some notes in your journal of your research. What is it about these values that draws me to them? What is about these values that makes them significant to me? What other examples can I recall of these values in action? You might remember something you did, or some action of a family member, co-worker, neighbor or someone in your community. The most important part of this exercise is to expand your understanding. This is achieved by delving deeper into the meaning of the values and asking questions. Answers may or may not come. The questions are what count. Sarah Mane is a Sanskrit scholar with a particular interest in the wisdom of Sanskrit as a practical means to life-mastery. Previously a teacher and school executive, today she is a transformational and executive coach. Sarah lives in Australia.